Infused Waters served at the Marriott made with fresh fruit and herbs in CQ’s Patent Pending Infusion Jars and Beverage Dispensers featuring Lemon Watermelon Infused Water, Red Raspberry Pomegranate Orange Infused Water, Lemon Pineapple Cayenne Infused Water, Strawberry Basil Infuses Water, and Lemon Cucumber Infused Water. Infused Water Station serving Lemon Watermelon Infused Water, Red Raspberry Pomegranate Infused Water, Lemon Pineapple Cayenne Infused Water, Lemon Cucumber Infused Water and Strawberry Basil Infused Water at the Marriott Marquis San Diego Marina. 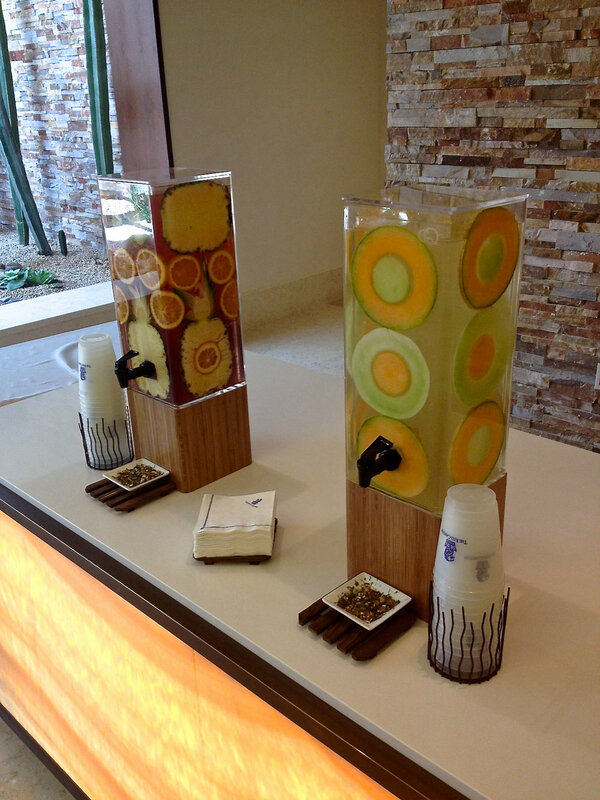 CQ Infused Waters were featured at the Global Hyatt Owners Meeting. The event took place last November at the Hyatt Regency Indian Wells. Infused Welcome Water at The Ritz-Carlton, Rancho Mirage. During check-in, guest can try masterful Welcome Waters by Jason Kinsella including Passion Fruit Pineapple Jalapeño Infused Water and Lemon Honeydew Cantaloupe Infused Water. CQ Infused Waters featured during Chef Fest at the Four Seasons Resort Hualalai. Chef Fest is a celebration of high-profile dinners, interactive cooking classes and culinary experiences, amazing wines and activities. This celebrated event is part of the Four Seasons Food & Wine global series and featured some of the country's top chefs coming together to cook, teach and entertain in an intimate and relaxed beach setting. The CQ Infused Waters pictured are Lemon Pineapple Cayenne, Passion Fruit Pineapple Orange, Mango Orange, Strawberry Basil and Strawberry Dragon Fruit Star Fruit. Infused Waters in the lobby of the Andaz Maui at Wailea. Lemon Watermelon Infused Water, Strawberry Dragon Fruit Star Fruit Infused Water, Lemon Pineapple Cayenne Infused Water, Lemon Cucumber Infused Water and Strawberry Basil Infused Lobby Water for the arrival of Hyatt’s Top Chefs, competing in the 2014 Hyatt The Good Taste Series. CQ Red Raspberry Pomegranate Orange Infused Water, Lemon Pineapple CaFouryenne Infused Water, and Lemon Cucumber Infused Water featured during an intimate cooking demo with Chef Mullen. Infused Waters for the Elite Check-In at the Marriott Marquis San Diego Marina. Marriott's Welcome Water consisted of Pineapple Mint Mango Infused Water and Lemon Cucumber Infused Water. Chefs Marco Canora, Aaron Brooks and Seamus Mullen fire up the grills for this beach bash on Kumukea Beach during Chef Fest at the Four Seasons Resort Hualalai. Fresh fruit and herb Infused Waters showcased during the event included Passion Fruit Mango Orange Infused Water, Passion Papaya Jalapeño Star Fruit Infused Water, Lemon Mint Infused Cocktail Mixer, Strawberry Basil Infused Water, Mango Orange Infused Water, Lemon Pineapple Cayenne Infused Waters, and Strawberry Dragon Fruit Star Fruit Infused Water. A bartender at the Hilton Orlando is serving up CQ Mango Mint Pineapple, Red Raspberry Pomegranate Orange, Lemon Mint and Peach Pear Ginger Infused Iced Tea. Each infused cocktail mixer is paired with a spirt. CQ Infused Waters were featured for Sheraton's Global GM Conference at the Sheraton Seattle. Upon arrival, GM enjoyed Lemon Watermelon Infused Water, Red Raspberry Pomegranate Orange Infused Water, Mango Mint Pineapple Infused Water, and Lemon Cucumber Infused Water. Infused Welcome Water in the lobby of the Andaz Maui at Wailea. Lemon Watermelon Infused Water, Strawberry Dragon Fruit Star Fruit Infused Water, Lemon Pineapple Cayenne Infused Water, Lemon Cucumber Infused Water and Strawberry Basil Infused Lobby Water for the arrival of Hyatt’s Top Chefs, competing in the 2014 Hyatt The Good Taste Series. 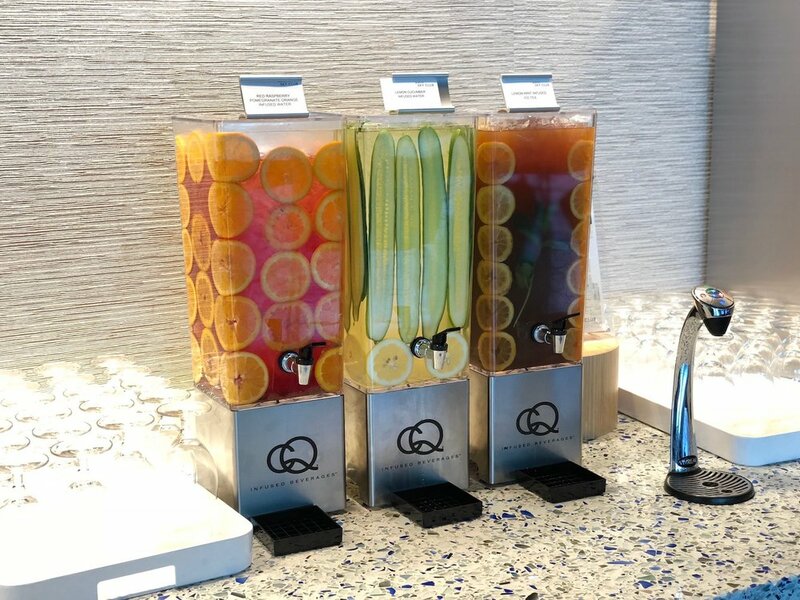 CQ Infused Beverages at Levy Restaurants Innovation Lab including Strawberry Watermelon Mint Infused Water, Lemon Cucumber Infused Water, Peach Pineapple Kiwi Infused Water, Black Raspberry Jalapeño Infused Lemonade, Peach Grape Ginger Juice Infusion and Lemon Mint Infused Iced Tea. Golf with Chefs Ned Bell and Ben Ford. Infused Cocktail Mixers featured our Lemon Mint Infused Cocktail Mixer and Red Raspberry Pomegranate Orange Infused Cocktail Mixer. Lemon Cucumber Infused Water and Mango Mint Pineapple featured at the Marriott Marquis Club Level Lounge. CQ Infused Lemon Cucumber Spa Water at the Four Seasons Resort Hualalai. CQ Infused Waters served during the Westin Hotels & Resorts GM Conference. CQ Passion Fruit Pineapple Orange Infused Water and CQ Lemon Cucumber Cantaloupe Infused Water at The Ritz-Carlton, Rancho Mirage. CQ Infused Water Station at the Viceroy Hotel Group's Commercial Leadership Meeting held at the Le Méridien Delfina Santa Monica. CQ signature infused beverages served included Peach Ginger Kiwi Juice Infusion, Infused Strawberry Lemonade, Lemon Mint Infused Iced Tea, Passion Fruit Pineapple Orange Infused Iced Tea, Lemon Watermelon Infused Water, Black Raspberry Jalapeño Mint Infused Water and Strawberry Watermelon Mint Infused Water. Chefs Marco Canora, Aaron Brooks and Seamus Mullen fire up the grills for this beach bash on Kumukea Beach. Infused Waters featured at during the event included Passion Fruit Mango Orange Infused Water, Passion Papaya Jalapeño Star Fruit Infused Water, Lemon Mint Infused Cocktail Mixer, Strawberry Basil Infused Water, Mango Orange Infused Water, Lemon Pineapple Cayenne Infused Waters, and Strawberry Dragon Fruit Star Fruit Infused Water. CQ Juice Infusions - Lemon Apple, Peach Grape Ginger and Strawberry Orange Pineapple. 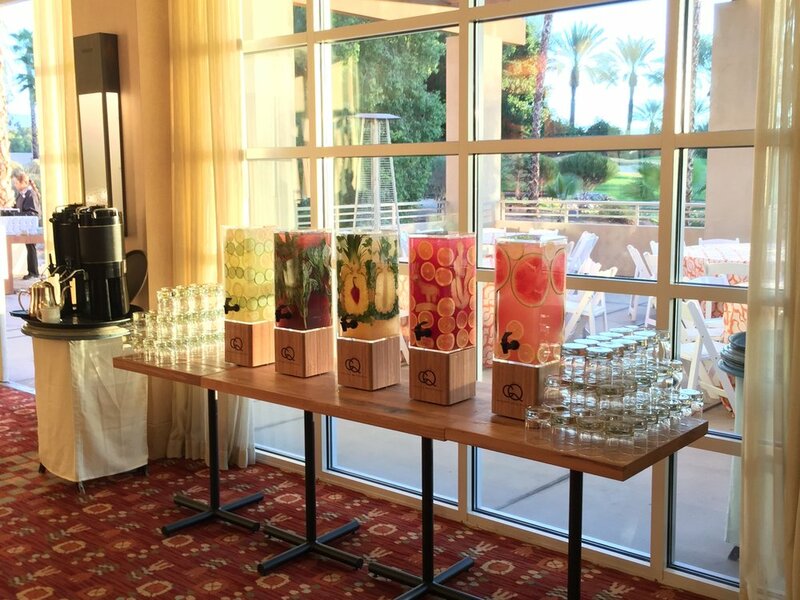 CQ Juice Infusions featuring Lemon Apple Juice Infusion, Peach Grape Ginger Juice Infusion and Strawberry Orange Pineapple Juice Infusion were featured at the 2015 Hyatt iLead Meeting. The event took place at the Hyatt Regency New Orleans April 14-16, 2015. Beautiful, Artisan Infused Waters served during at Gaylord Opryland Resort & Convention Center. CQ Infused Waters served at Destination Hotes & Resorts General Manager Conference, Eden Roc Miami Beach. Infused Waters made with fresh fruit and herbs displayed and served in CQ’s Patent Pending Infusion Jars and Beverage Dispensers featured Lemon Watermelon Infused Water, Red Raspberry Pomegranate Orange Infused Water, Lemon Pineapple Cayenne Infused Water, and Lemon Cucumber Infused Water. CQ Lemon Cucumber Spa Water. CQ Infused Mint Julep Mixers served at Hyatt's iLEAD Meeting in New Orleans, LA. 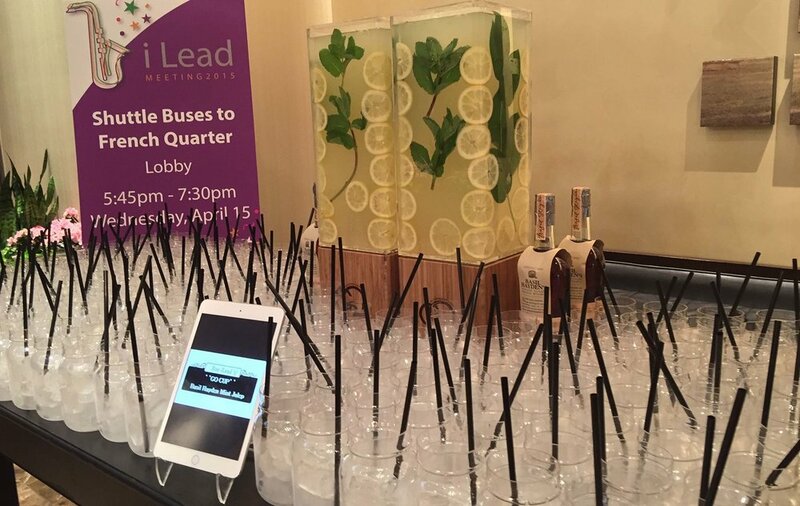 CQ Juice Infusions were featured at the 2015 Hyatt iLead Meeting, held at the Hyatt Regency New Orleans. 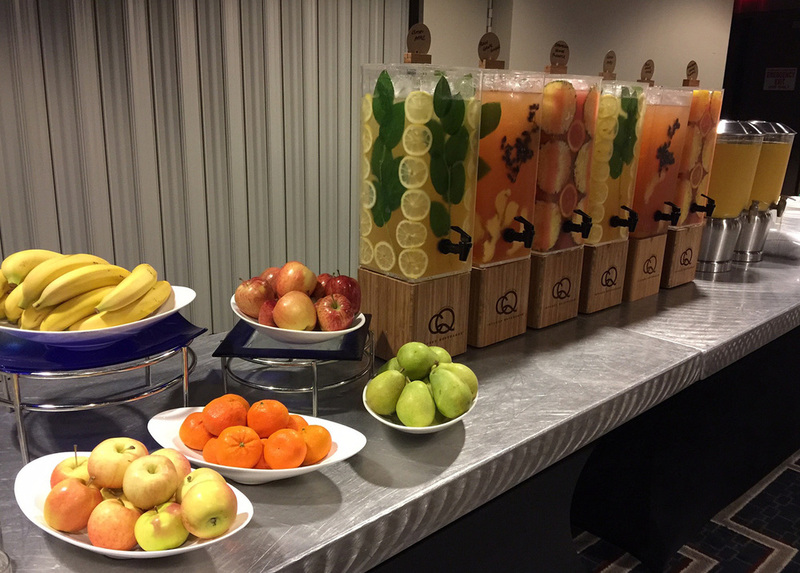 During the breakfast for 600, we featured the following CQ Juice Infusions: Lemon Apple, Peach Grape Ginger and Strawberry Orange Pineapple. They were a huge hit! CQ Infused Beverages at Levy Restaurants Innovation Lab including Peach Grape Ginger Juice Infusion, Black Raspberry Acai Jalapeño Infused Lemonade, Lemon Mint Infused Iced Tea, and Lemon Cucumber Infused Water. CQ Lemon Cucumber Spa Water served at NuFace's event at Nordstroms. CQ Lemon Cucumber Infused Water and Mango Pineapple Ginger Infused Water in the lobby of the JW Marriott Minneapolis Mall of America. CQ Lemon Watermelon Infused Water and Red Raspberry Pomegranate Orange Infused Water in the lobby of the Newport Beach Marriott Hotel & Spa. CQ Peach Grape Ginger Juice Infusion, Lemon Apple Juice Infusion, Strawberry Pink Grapefruit Juice Infusion and Mango Orange Pineapple Juice Infusion featured at Loews Hotels Food & Beverages Photoshoot. CQ Lemon Watermelon Infused Water, Lemon Cucumber Infused Water and Peach Pineapple Kiwi Infused Water in the lobby of the Loews Vanderbilt Hotel. CQ Infused Water welcomes guest to the new Lincoln Experience Center at Fashion Island in Newport Beach, CA. CQ's signature Lemon Watermelon Infused Water is pictured above. Infused Waters served at the Marriott Marquis San Diego made with fresh fruit and herbs in CQ’s Patent Pending Infusion Jars and Beverage Dispensers. During this event, they featured Lemon Watermelon Infused Water, Red Raspberry Pomegranate Orange Infused Water, Lemon Pineapple Cayenne Infused Water, and Lemon Cucumber Infused Water. CQ Infused Beverages at Levy Restaurants' Innovation Lab. Beverages featured include CQ's Peach Ginger Kiwi Juice Infusion, Lemon Cucumber Infused Water, Infused Strawberry Basil Lemonade, Lemon Mint Infused Iced Tea and Strawberry Watermelon Mint Infused Water. WHEN'S THE LAST TIME A BEVERAGE BLEW YOUR MIND? It’s probably tough to recall. At CQ Infused Beverages, we were tired of sugary bottled waters, calorie dense bulk beverages, and mundane catering options that feature convenience store drinks at 5-star prices. So we set out to create something better - jaw dropping beverage displays with reality altering flavor options to back them up. We believe that in the space between uninspired, single-serve, bottled beverages & sugar-laden, fountain sodas & juices exists an opportunity - an opportunity to freely explore nature’s colors, tastes, & scents to create something both beautiful & memorable. At CQ Infused Beverages, we want to change how water, juice, iced tea, lemonade, & cocktail mixers are being constructed, displayed, & served. By marrying our simple, yet revolutionary, patent pending beverage system with our CQ Purees, we’re enabling restaurateurs, hoteliers, & food service providers to offer healthy, eco-friendly, infused beverages throughout the world.